Atwater, a well-known and influential community leader, helps change the heart and mind of Ellis, then the president of the Durham Ku Klux Klan, during a period of stark racial divide. Ellis died in 2005, and Atwater died a decade later in 2016. 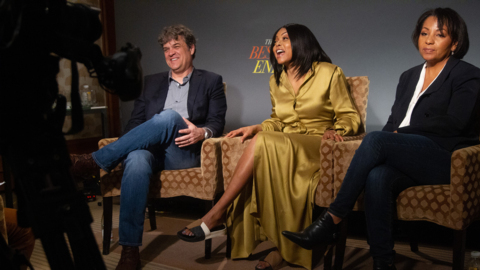 Their story was told in the 2007 book, “The Best of Enemies: Race and Redemption in the New South,” by Osha Gray Davidson, who also attended the premiere. Tuesday’s premiere was a family reunion for Atwater’s family, and a chance for them to celebrate the matriarch of the family. Ann Nakia Green, one of Ann Atwater’s grandchildren, said her grandmother was a fan of “Empire” and endorsed Henson playing her on the big screen. Set in 1971, the film depicts a Durham deeply divided by race that must come together to make decisions about the city’s children and education. 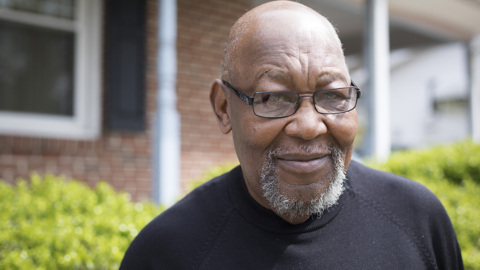 In real life, Raleigh resident Bill Riddick organized a 10-day forum, called a charrette, to bring the residents together to learn the power of compromise and thoughtful discussion. Riddick’s role in the film is a prominent one. Riddick, who attended Tuesday’s premiere, said the power of honest conversation is needed in today’s tense political climate. Around the corner from the theater is a mural of Atwater and Ellis, included among other Durham civil rights leaders. Green, Atwater’s granddaughter, who grew up in Durham and returned from Texas for the premiere, said the mural is a site she visits when she is back home. She first met Ellis when she was 7 years old and said he and her grandmother could finish each other’s sentences. Their relationship was more like brother and sister, Green said, than friends. Atwater even spoke at Ellis’ funeral. That unlikely unity could be a useful lesson today, Green said. “The story is so much bigger than her, in the sense that she really showed us how we could come together and get things done,” Green said. Local activist Jonathan Wilson-Hartgrove, who said he met Atwater in 2003, introduced the film. Tuesday’s premiere was a fundraiser for the Poor People’s Campaign led by the Rev. William Barber. Wilson-Hartgrove is a leader in the Poor People’s Campaign movement. Wilson-Hartgrove said Atwater put a photo of Barber by her bedside later in her life. He was pictured speaking on the National Mall in Washington, D.C. Barber made an unannounced appearance at Tuesday’s screening, drawing a standing ovation. 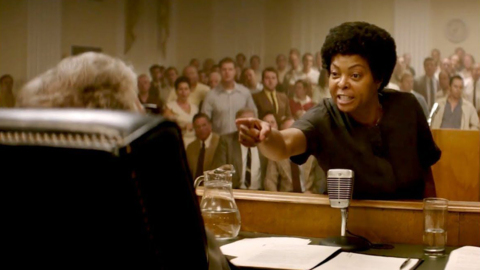 ‘The Best of Enemies” stars Taraji P. Henson as civil-rights activist Ann Atwater and Academy Award winner Sam Rockwell as Ku Klux Klan leader C.P. Ellis, telling the true story of events in Durham, NC.